The rankings, which are generated from 2015 data, are among the most watched of their kind in the country. This year, Ivy League schools Princeton University, Harvard University and Yale University took the top three spots respectively, with the University of Chicago tying Yale for third place. Johns Hopkins University ranks directly ahead of the College at 10th place, while the California Institute of Technology falls behind. Last year, Dartmouth was tied with Northwestern University for 12th place. In U.S. News’ rankings of institutions with the best undergraduate teaching, the College placed seventh, down from placing second in the category last year. The publication announced that the ranking methodology for its best colleges list fell under two broad categories of consideration: the views of educational experts regarding the rigor of the academic education as well as the publication’s vision of what a higher educational experience should entail. Specifically, U.S. News used the following criteria to assess schools for its 2017 edition: graduation and first-year student retention rates, faculty resources, assessment from administrators at other institutions, financial resources, selectivity, alumni loyalty, graduation rates and high school counselor college ratings. For the Class of 2020, 53.1 percent of students accepted offers of admission. In previous years, Dartmouth’s yield rate has fallen below 50 percent. Just under half of the Class of 2020 received need-based scholarships, with the average scholarship amounting to over $46,000. While most criteria remain unchanged, the report indicated that there were a few adjustments in its annual assessment of the best colleges and universities. First, the publication started using the Carnegie Classification of Institutions of Higher Education, a way to classify institutions in the United States based on the following categories: doctorate-granting universities, master’s institutions, associates colleges, baccalaureate colleges, tribal colleges, special focus colleges and universities and institutions not classified. This system has been frequently used by the U.S. Department of Education and other higher education researchers. Due to the adoption of the Carnegie Classification, more than 10 percent of the schools for this year’s U.S. News report changed from their previous placement. Under this system, an institution formerly considered a regional university might now be referred to as a national university. In addition to this classification model, the publication altered its analysis of class size ranking for the new edition. Forty percent of the total faculty resources criterion is evaluated based on class size, which was previously divided into two components. Class size was previously measured by calculating the proportion of classes with less than 20 students as well as by the proportion of classes with 50 or more students. These proportions accounted for 30 percent and 10 percent of the faculty resources score, respectively. U.S. News now only calculates one class size component, which still accounts for 40 percent of the faculty resources score. The publication said that this change helped to utilize all of the information that schools have released regarding class size. Dan Lee, one of the co-founders of Solomon Admissions Consulting, said that the students his company works with are strongly affected by U.S. News and World Report rankings. Some students almost look at the rankings exclusively, he said, which causes them to overlook other factors like fit and finding a place that may be an overall better option for them. Lee emphasized that students should ultimately focus their college selection process based on their goals and aspirations. Grace Replogle ’19 agreed with Lee, noting that fit has always been most important to her. She said that the rankings are not her biggest priority, and that she is just happy to be in the Dartmouth community. Ethan Klaris ’20 said that his high school emphasized the prestige and ranking of colleges and universities. However, Klaris also said it was important to him that he balance prestige and fit. Vice Provost for Enrollment and Dean of Admissions and Financial Aid Lee Coffin said he is pleased with the 2017 rankings. 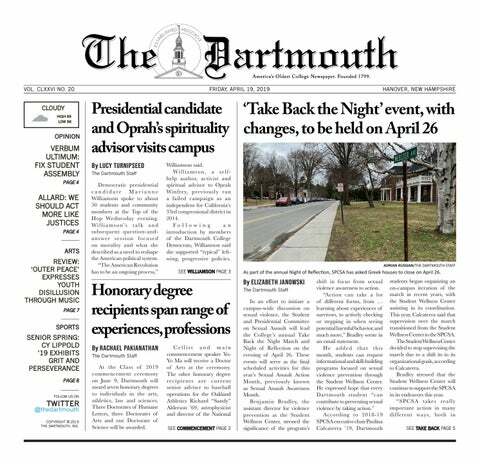 “I see all of Dartmouth’s outcomes as broadly positive,” he wrote in an email.